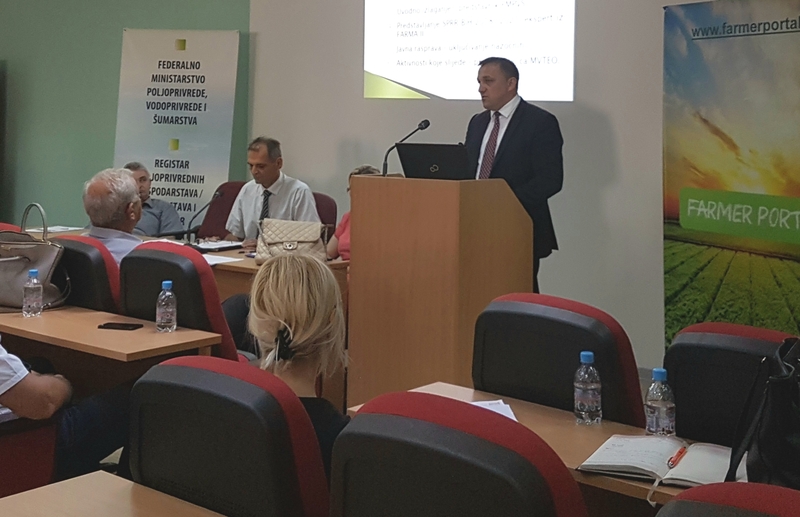 In cooperation with the FARMA II Project and the Ministry of Foreign Trade and Economic Relations of BiH, Federal Ministry of Agriculture, Water Management and Forestry organized today a public consultation on the Draft Rural Development Strategic Plan of Bosnia and Herzegovina for 2018-2021. Acknowledging the importance of this document, minister Dedić pointed out the trade deficit, which is set to increase in the face of fierce competition coming from the EU, as one of the main challenges hindering the competitiveness of our agriculture. “For this reason, the need for adoption of a rural development strategic plan could not be more urgent since having such a document in place is a precondition for accessing the EU IPA II funds earmarked for agriculture and rural development, which would open up the opportunities for greater investments in farm restructuring and modernization of production models, the overall development of our agriculture in terms of improving the farm infrastructure, equipment, and machinery, enhancing the environmental protection, agricultural entrepreneurship and employment in rural areas,” said minister Dedić in his address.